Safety is a primary concern for both small businesses and large companies. Often overlooked, emergency light installation gives you the best chance of saving lives and preventing damages regardless of the scenario. Lighting Services, Inc provides both industrial and commercial clients with exceptional products that guarantee safety and security. Your business can have a fire outbreak or be invaded by dangerous people. The employees will definitely have a clear and easy way of getting out of the situation. Emergency exit points that are well light direct people in the right routes to use while leaving the premise. No confusion experienced as long as all corners are visible. This makes the employees work well with the knowledge that their safety is guaranteed. Emergency exit lighting ensures fast responding in case of chaos. For instance, if a fire breaks out in a place with no exit lights, the smoke emitted can cloud the place and make it incredibly difficult to see. A well illuminated room provides a clear layout for the responders to know where exactly they will go to assist. The federal law for safety regulations require every emergency exit to be well light. In order to provide a better illumination, the signs should at least measure 6''L × 2''W. 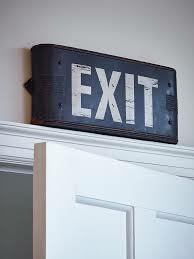 Failing to illuminate the exit signs may lead to fines or other punishments from the safety inspector. Proper maintenance of the lighting system is less costly as it reduces the cost of repairs. Just like other emergency devices like fire extinguishers, the emergency exit lights need inspection and recertification annually. Consistent inspection makes sure that everything is in order. For more benefits, contact us.